Winsted makes high-tech professional consoles for offices, broadcasting centers, and security monitor workstations. 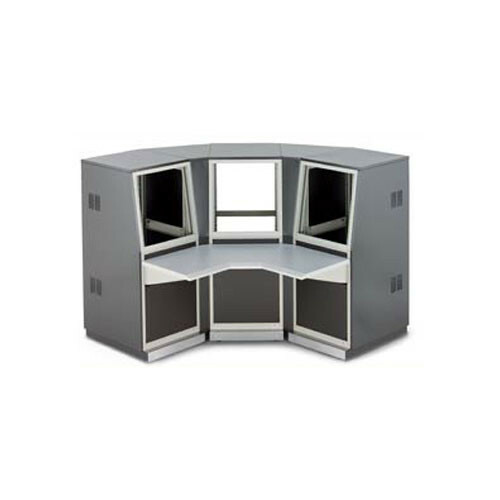 This 3-Bay Corner Console with Base and 24.5" Top Unit Backward Tilt (Gray) features a wrap-around tabletop expanse that turns any corner into a live monitoring station. It revels in a distinguished construction that includes Winsted's pearl gray work surface, and it features three spacious top consoles with a 24.5" tilt that ensures a comfortable line of vision for operators. This 3-Bay Corner Console model sits at an ergonomically ideal height with ample "U"-shape keyboard and controller space. Winsted offers you full customization so you can interchange any of these elements if you'd like. All of the conveniences you need are in a Winsted, where advanced workstations become your inspiration. Whether it's a corner filler kit for a 3-Bay console or bay/corner/bay components, all Winsted System/85 Console arrangements allow you the freedom to create the technically-advanced workstation you need. Expand or contract with Winsted. A 24.5" horizontal backward tilt in the top units of this corner console leaves operators strain-free and comfortable, while adjusting monitors to a natural viewing position. Turn any corner into an immediate broadcast center with this wrap-around console. The design allows operators to flow more easily and comfortably between various tasks. Each console and corner filler features and open-air construction that maintains a cooler temperature and allows cables to stream through the console and into wall outlets without being seen. This Winsted Corner can add a crisp look to your office with its pearl gray finish.